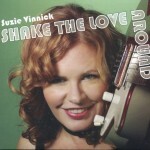 Possessed of enough vocal sass and soul to hang out exclusively on blues turf, Suzie Vinnick ups the ante with songwriting partnering that crosses borders with skill and ease. While delivering the bluesy goods on tracks such as “Lean Into The Light” and “Watch Me”, the Ontario-based multi-instrumentalist casts a spell in ballad country with “Crying A River”. Ms. V serves up some decidedly un-shabby covers of John Fogerty’s “A Hundred And Ten In The Shade” and Percy Mayfield’s “Danger Zone” as well. Stealing this show, however, may be a bona fide folk anthem-in-waiting, “The Golden Rule”.